Termites are hard insects to like for obvious reasons. However, if you had to choose a favorite then you would probably want to choose the macrotermes genus of termites. Most Macrotermes species are not pests in people’s homes, though some of these termites are crop and tree pests. But it is unlikely for anyone in the world to find these termites eating away at their houses. This is because macrotermes termites cannot survive in urban environments. 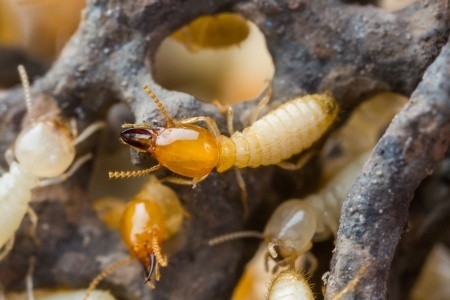 In fact, very few of these termites can live outside of their natural tropical environments. Even for people living in rural tropical areas, these termites will only build mounds near roadsides, or in people’s yards or gardens. The macrotermes genus includes the largest termites of all. Although some sources differ, most scientific articles claim that the Macrotermes natalensis is the largest species of any termite in existence, with queens measuring six full inches in length. As far as scientists are aware, there are three hundred and thirty macrotermes species distributed throughout Africa and Asia. With the exception of subterranean macrotermes species, all of these species build mounds that range in height from one foot to an astounding thirty feet. Although several termite genuses build mounds, it is commonly agreed that macrotermes species build the most picturesque mounds of all termites. The most notable aspect of the macrotermes species is their ability to farm fungus, which all species of this genus do regularly. These termites have been farming fungus in their nests for millions of years. The macrotermes species manage this incredible feat by keeping the climate in their nests at just the right temperature, which is between twenty nine and thirty two degrees celsius. The fungus grows out of chewed plant matter and a type of wood rot. The wood rot belongs to the Termitomyces genus, and even humans eat the wood and consider it a delicacy in some tropical areas. Unlike the macrotermes genus of termites, humans have never succeeded in cultivating fungi in the parched African savanna. After millions of years of farming, it is no wonder these termites are better farmers than humans. Do you think that this fungi is edible to humans? If so, do you think that this fungi is commonly served as food in tropical regions of Africa?